This week’s post comes courtesy of one of our most active participants. It’s been about a year since he participated in the group ADHD coaching sessions, but this gentleman still writes to us regularly to keep in touch and practice the skills he learned in our sessions. 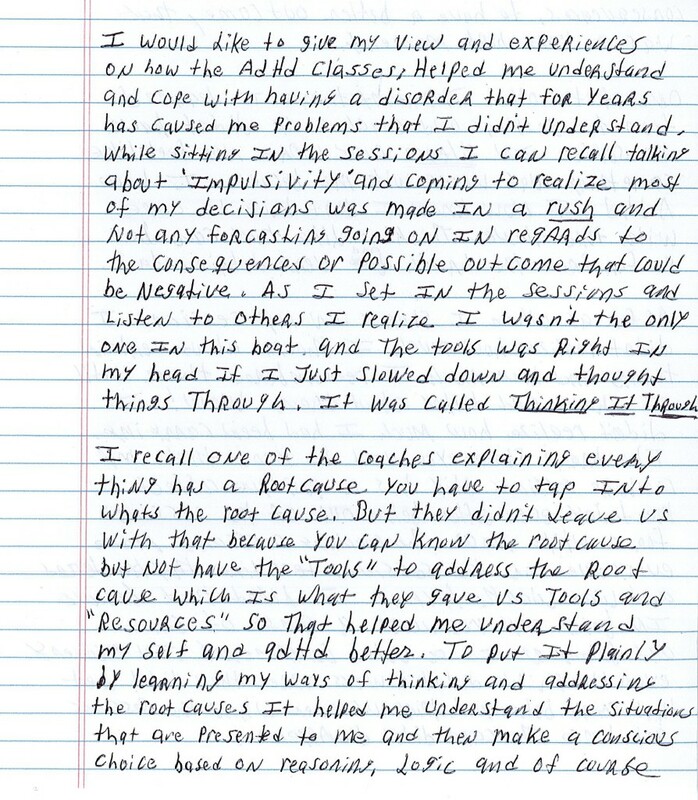 We are grateful for his thoughtful, introspective piece on his experiences with ADHD and the ADHD Corrections Project. The quotation marks and underlined text are reproduced as the in the original, but we have highlighted particularly eloquent phrases in red. “I would like to give my view and experiences on how the ADHD classes helped me understand and cope with having a disorder that for years has caused me problems that I didn’t understand. While sitting in the sessions I can recall talking about ‘impulsivity’ and coming to realize most of my decisions was made in a rush and not any forecasting going on in regards to the consequences or possible outcome that could be negative. As I set in the sessions and listen to others I realize that I wasn’t the only one in this boat and the tools was right in my head if I just slowed down and thought things through. It was called thinking it through. I recall one of the coaches explaining every thing has a root cause. You have to tap into whats the root cause. But they didn’t leave us with that because you can know the root cause but not have the ‘tools’ to address the root cause which is what they gave us. Tools and ‘resources.’ So that helped me understand my self and ADHD better. To put it plainly, by learning my ways of thinking and addressing the root causes it helped me understand the situations that are presented to me and then make a conscious choice based on reasoning, logic, and of course, consequences, to have a better outcome. That was a light bulb moment. One of the other important things I learned from the sessions and coaches I didn’t have to suffer in silence any more nor feel like something was wrong with me because I have ADHD. I now know I don’t have to cope with this alone. Thinking like that can be so far from the truth and very detrimental. As far as when I shared in my sessions I didn’t realize how much I thought about certain things and how much I remembered them until I shared and talked about them. Wow! I didn’t realize how much I had been carrying. The brain stores you need to know that. My coaching sessions still has a positive affect on me today even after being out of the sessions for a while now. The coaching sessions made every one in the sessions feel like they mattered and was worth helping. I liked that because in being in recovery a sense of care and belonging is a vital component in recovery. Even though we didn’t always agree they didn’t let that come between helping us even when the sessions got tense. The care didn’t disappear. In having a co-occuring disorder of mental health and substance abuse, I was able to receive informational tools to address both. Thanks to all my coaches. Big kudos. I hope my message touches and reaches some one and helps some one to realize they are not alone. Just as this participant writes, we hope you take something from this entry that gets you one step closer to where you want to be. Please remember that if you’d like to receive email notifications when new posts are released, you can do so in the left sidebar!